Decorated flip flops have been around for just about as long as flip flops have. I remember decorating them when I was a little girl. They are so much fun to wear and show off. There are so many craft projects for kids and this is just one of them. They can take a pair of flip flops and make them into a work of art. All they need is some paint or any kind of items and come up with something that all the other kids want. You know how kids like to show off what they have made. The next thing they know all of their friends have some too. 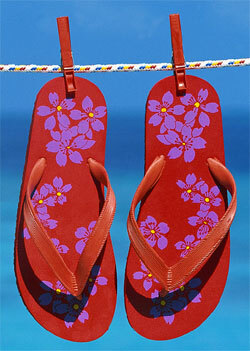 Have your child arrange the flowers on the flip-flops in the design they want. After they have designed them the way they want them, lift each flower one at a time and squeeze hot glue onto the flip-flop and replace the flower. Lift the next flower and repeat the process. Now they can attach the plastic decoration that they have chosen for the center. They can use any kind of bird or small figurine that they like. A butterfly looks great in the center. Boys like something a little more masculine. They can use rick rack and then apply small animals like frogs or soldiers. Brown flip-flops with a tan rick rack looks really nice and the boys love them. You can also use paints to paint pictures on the flip flops. I have seen some really wild ones that kids have done. They love to just use their imagination and paint what ever they like. Kids can make their decorated flip flops to match their school colors or favorite sports team. They can give them as teacher gifts or birthday presents. There are so many free crafts for kids ideas that all you have to do is let your mind run wild and the possibilities are endless.